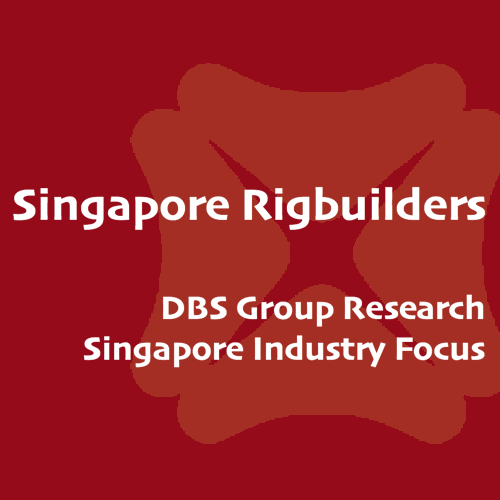 Singapore Rigbuilders - DBS Research 2016-01-27: Merger on the cards? Bloomberg reported that Temasek Holdings is discussing various options for Keppel Corp (Keppel) and Sembcorp Industries Ltd.(SCI), ranging from divesting non-core assets to selling shares, to brace for a prolonged sector downturn, during a regular portfolio companies review meeting on 25 Jan. In our view, the divestment of non-core investment like M1 is a strong possibility as it has been parked under the investment arm for several years. This could free up over S$400m for capital recycling. 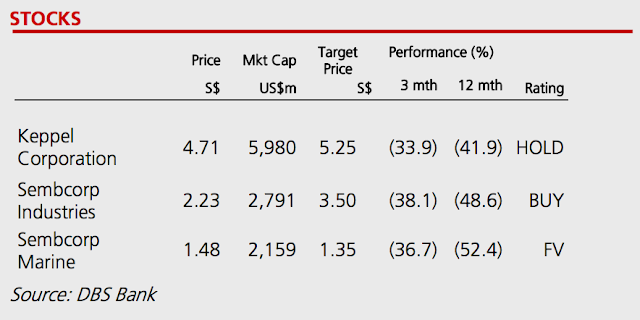 Our Telco analyst has a HOLD call on M1 with TP of S$2.60, implying 10% upside potential. We see lower likelihood of divestment of K-REIT (worth S$1.2bn) as it is one of the two property fund management vehicles for Keppel Land, although it remains to be seen if Keppel will pare down its stake in K-REIT. As for Keppel Infrastructure Trust (KIT) and Keppel DC REIT, which are worth S$330m and S$250m respectively, both are core to Keppel and thus unlikely to be put on sale. Other investments - K1 Venture, KrisEnergy and Dyna-Mac - are possible divestment candidates but values are relatively small, worth a total of $265m. ... as the stocks are trading at 20% to 30% discounts to their respective book values. In addition, Keppel has ample debt headroom of approx S$5bn before hitting its desirable net gearing of < 1x. SMM is currently trading at 1.1x PB, but its book value is subject to write downs. While we cannot rule this out completely, unless the GLCs have a strong basis to raise fresh equity, investors may not take the news in a positive light as the exercise will be dilutive to ROE. Recent spate of events has turned for the worse for Singapore’s rigbuilders. The above unverified discussions by Temasek, if true, raise concerns over the business outlook, reviving speculation of restructuring of the two rigbuilders. We believe injection of Keppel O&M into SMM via RTO could be feasible. Typically, the takeover target commands a share price premium post announcement, but in this case, it might be risky to play this angle without clarity on restructuring plans, timing, and financial details etc. In this report, we lowered our TP for SMM to S$1.35 and SCI’s TP is adjusted to S$3.50 accordingly. Stripping out the market value of SMM, Salalah and Gallant Venture, SCI’s utilities business is valued at unwarranted < 5x FY16 PE.